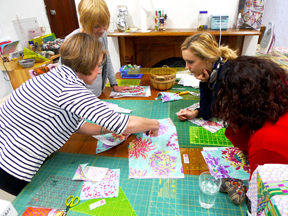 Twelve women, united by concept alone set out to make 12 quilts, 12" square based on a different theme each time. The result is a book full of interesting photos, concepts and ideas. 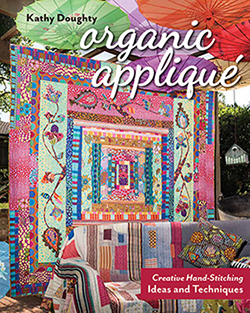 As a reader of the book we work side by side these women getting an insight into how it all happened, into the minds of the quilters and their spaces, their techniques and their imagination. It is hard not to imagine as we read just how we would handle the task ourselves and that is where the fun starts. The themes connect the individuals who are really connected only by the internet...at the start anyway. 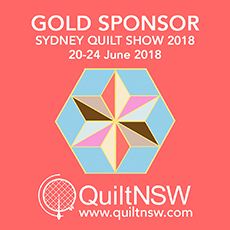 "To portray humble and ordinary things in an artful way" What a great concept and that is how Diane Perin Hock describes her quilt theme, Dandelions. She was looking for something that would be specific enough to involve everyone but broad enough to produce a lot of images. The themes that follow are of the same vein. Specifically broad, if that is possible and I think now it is. 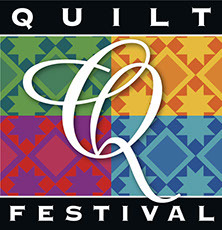 Now these 12 artists are connected by two years of making quilts, a traveling exhibition and now the book , Twelve by Twelve, The International Quilt Challenge. I just got this book to review and firstly I'll say, lucky me! Sharing concept ideas became an integral part of the process. Poems, images, techniques were all discussed amongst the twelve women bringing new extensions to life I am sure. What I found as I read the pages is the amount of freedom this process brought along. Already art quilters, they had a variety of techniques at hand but it is interesting to note the application of the techniques. I'd like to pick a favorite theme but there are too many that appeal. Some inspire an image immediately and some inspire thought to that end. Take passion...hmm where to start...but chairs...ok, somewhat obvious. However, whether the idea springs to mind or evolves there is a lot of thought involved and it is just fun to work the brain now full of ideas and techniques! There are a lot of quilt books out there but this one is a must in my collection. Every time I pick it up I go into savour mode! I know some of you may be snickering in disbelif at the thought of me sitting and quietly with a book. (Over the last few weeks I can't even begin to count how many people have asked me if I am tired!) In a nutshell, the answer is YES. However, I am woman, hear me ROAR! I will not give in...today. Last Saturday I had the IMMENSE pleasure of a rain induced day off! Instead of a rugby launch followed by a soccer launch followed by another rugby game I got to stay home. That meant I could miss seeing this happen...This shiner was actually from training but the other eye coped a poke in the actual game. Good thing they won. Thank you for the wonderful book review. We have been very excited about the inspiration readers are finding from it. Yes thank you. I have fond memories of visiting you! I really enjoyed your review of the book. Thank you for sharing it. Do you think I could refer to your post if I do a post about the book? This is the most amazing mash up I have ever heard as I am a HUGE Annie Lennox fan. Why can’t we download this amazing song? I would listen to this over and over again on my ipod if I could. The accompanying video is equally fabulous! You have outdone yourself. Now do a mash up of Cher songs and a mashup of Donna Summer as well. You are simply amazing! Keep up the incredible work! This should be common sense, but many first time investors seem to forget this golden rule.